The Thunderous Stars of the Storm. Take a closer look at some of the powerful cards from the latest Pokémon TCG expansion, Sun & Moon—Celestial Storm. The latest expansion for the Pokémon Trading Card Game, Sun & Moon—Celestial Storm, brings plenty of fantastic new cards to add to your collection. To prepare you for this oncoming maelstrom, we want to check out some of the most exciting cards you’ll find within. Whether you’re drawn to these cards because of their mighty GX attacks or their interesting Abilities, or just because they depict one of your favorite Pokémon, you’ll find plenty to enjoy in this expansion. How can you not be delighted by this cheeky Pokémon? 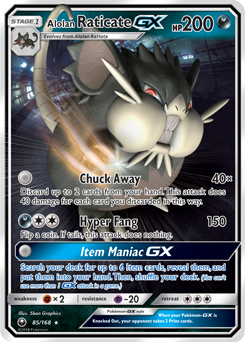 Alolan Raticate-GX may look fierce with its angry eyes and gnashed fangs, but we really just want to pinch those chubby cheeks! Thanks to a couple of attacks that have zero Energy cost, it also makes for an interesting card. If you’re running a lot of Item cards in your deck to support your Pokémon, Alolan Raticate-GX‘s zero-cost Item Maniac-GX attack, which lets you pull six of them out of your deck and into your hand, is an excellent way to get those cards into play. Its other zero-cost attack, Chuck Away, can do up to 80 damage, provided you’re willing to discard two cards from your hand. With a single attack that does a meager 30 damage, Latias may not seem all that special at first glance—but when used to support other Dragon-type Pokémon on your Bench, it can be the linchpin of your deck. 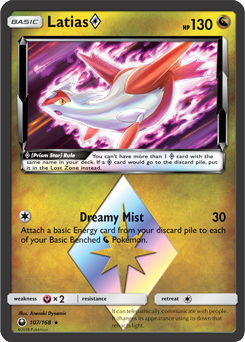 Dreamy Mist’s low attack cost of just one Colorless Energy makes it easy to set up, and the attack’s strength lies in its added effect, which allows you to attach a basic Energy card from your discard pile to each of your Benched Basic Dragon-type Pokémon. Assuming you can get a load of Energy cards into that discard pile, you can quickly get your Benched Pokémon powered up and ready for a counterattack. Then, thanks to Latias ‘s low Retreat Cost, you can easily get it back to your Bench and free up space to bring in a heavy hitter. Like Latias , Latios depends on you having a Bench full of Dragon-type Pokémon to bring forth its true worth. 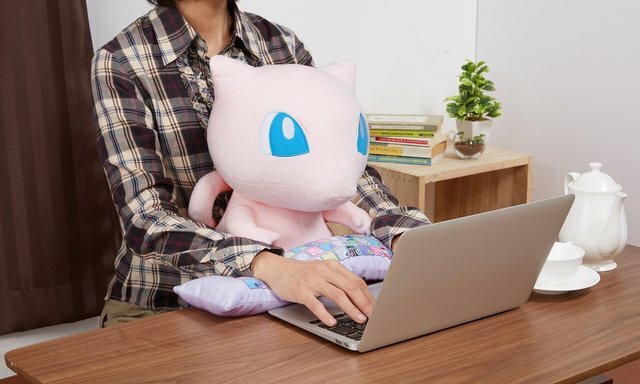 In this case, though, you’ll need Evolution Pokémon on your Bench, rather than Basic. Latios has a single attack, Dragon Fleet, which costs only two Colorless Energy. 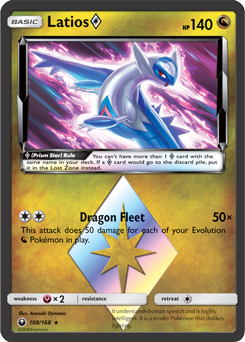 The attack does 50 damage for each of your Evolution Dragon-type Pokémon in play, so if you happen to have a Bench full of those, you could deal a devastating 250 damage each turn. Evolution Pokémon that are Dragon types aren’t too common—there are only two in this expansion, for instance—so you’ll need some careful planning to unleash Latios ‘s full potential. It’s about time Mr. Mime was given its due. This Mr. Mime-GXcard presents the famous Psychic-type Pokémon in all its glory. 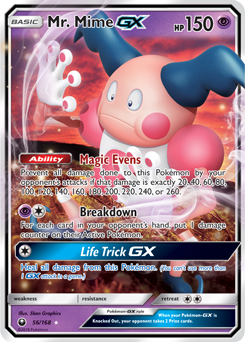 It’s hard not to get a kick out of its Magic Evens Ability, which prevents Mr. Mime-GX from taking any damage from an opponent’s attack if that damage is a multiple of 20 (up to 260 damage). Put Mr. Mime-GX up against the right opponent, and it will be untouchable! Its Breakdown attack, which lets you put 1 damage counter on your opponent’s Active Pokémon for each card in their hand, can be inconsistent, but if Mr. Mime-GX does end up taking a beating while trying to do some damage, it can heal up using its Life Trick-GX attack. Metagross has one attack, Meteor Mash, that only requires one Metal-type Energy. It’s a decent attack, doing 60 damage the first time and 120 damage if you use it again on your next turn, but a lot of opponents can stand up to that. 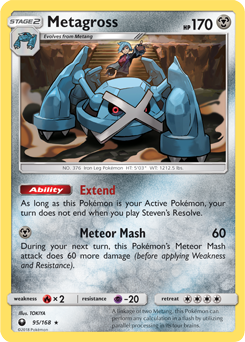 The Extend Ability is what makes Metagross a valuable contributor to your deck, in combination with the powerful Supporter card Steven’s Resolve (see below). Just be aware that the Ability is only in effect while Metagross is your Active Pokémon, and with a Retreat Cost of 4, it’s tough to switch out. You might want to attach a Float Stone so you can get Metagross back to your Bench and bring in a stronger attacker, if you don’t need the Ability. This Supporter card can prove invaluable when you’re looking for specific cards. 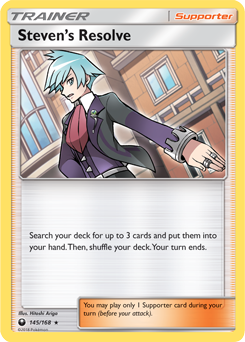 Play Steven’s Resolve, and you can search your deck for up to 3 cards to put into your hand. Need to find a useful Item, quickly evolve a Pokémon, or bring a powerful Pokémon-GX into play? This is a surefire way to get the cards you need right away. Of course, that much freedom to manipulate your hand comes at a cost—once you play Steven’s Resolve, your turn ends, so you can’t actually play any of those cards yet. That is, unless Steven’s partner Metagross (see above) happens to be your Active Pokémon. Its Extend Ability says your turn doesn’t end when you play Steven’s Resolve, so you can take full advantage of those three new cards! 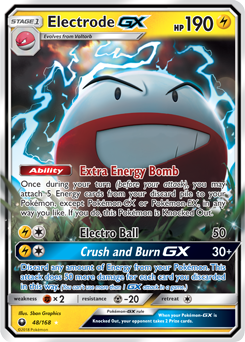 The explosive Electrode-GX makes an impressive Pokémon TCG debut! This Lightning-type Pokémon has a solid 190 HP and a low Retreat Cost, along with an interesting support Ability and a potentially devastating GX attack. Crush and Burn-GX has a low Energy cost but does an extra 50 damage for each Energy card you discard from all of your Pokémon when using the attack. It might be worth making sure your team has a little extra Energy to quickly take out an opponent! The Extra Energy Bomb Ability is a fine way to retrieve Energy from your discard pile and immediately distribute it to any Pokémon other than a Pokémon-GX or Pokémon-EX. However, this Ability also Knocks Out Electrode-GX, so use it wisely! With only 80 HP, the Mythical Pokémon Jirachi may not be the bulkiest Pokémon to appear in the Sun & Moon—Celestial Stormexpansion, but it comes equipped with an unusual Ability that makes it fun to play. 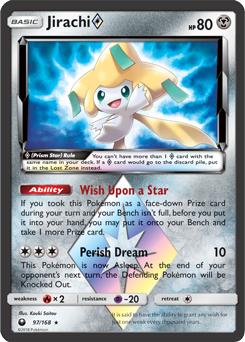 Thanks to Jirachi ‘s Wish Upon a Star Ability, you’ll probably want this card to end up as a Prize card—if you happen to take it as a face-down Prize card when your Bench isn’t full, you can put it onto your Bench and take another Prize card. Not a bad way to get one step closer to victory! Even Jirachi ‘s lone attack is a bit odd. Perish Dream does minimal damage, and it leaves Jirachi Asleep, but it also forces your opponent to take action to avoid having the Defending Pokémon Knocked Out at the end of their next turn. The Metal-type Ultra Beast Stakataka-GX is useful if you’re going up against a strong opponent that you need to wipe out with a single attack. Its Assembly-GXattack can inflict a ton of damage, especially if you unleash it later in your game. The attack does 50 damage, plus 50 damage for each Prize card that you’ve already taken. That means you could potentially hit your opponent for 300 damage if you hold off on using the attack until you’re on your last Prize card. 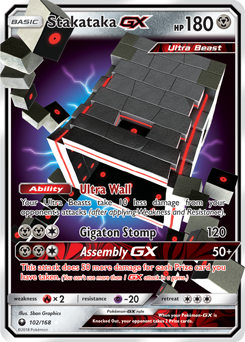 Stakataka-GX‘s Ultra Wall Ability serves as a nice little bonus if you have multiple Ultra Beasts in your deck, providing them with a bit of protection from your opponent’s attacks. Ultra Beasts are a powerful recent addition to the Pokémon TCG, but they’re not going to do you much good if you can’t get them into play. And what if you’re unfortunate enough to have one of these mighty Ultra Beasts trapped in your Prize cards? Well, that’s when it’s time to bust out Beast Ball. This handy Item card lets you look at your face-down Prize cards—but that’s not all! 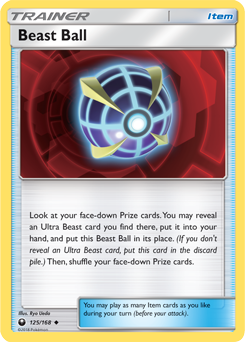 If you reveal an Ultra Beast from among them, you can put it into your hand and put the Beast Ball in its place as a Prize card. From there, it’s up to you to decide how to use that Ultra Beast to decimate your opponent!